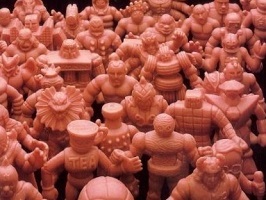 If you can’t have the “M.U.S.C.L.E. Smell,” is there a way to remove bad smells? Which is more effective for removing paint from a M.U.S.C.L.E. figure – 409 or Simple Green? Read, and watch, the results! Does boiling a figure remove silver boat paint? Read, and watch, the results! Even though there has not been much posted activity, there has been a tremendous amount of activity taking place.